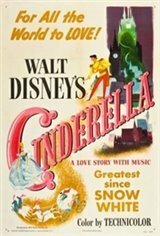 Cinderella was Walt Disney's return to feature-length story cartoons after eight years of turning out episodic pastiches like Make Mine Music and Three Caballeros. A few understandable liberties are taken with the original Charles Perrault fairy tale (the wicked stepsisters, for example, do not have their eyes pecked out by crows!) Otherwise, the story remains the same: Cinderella, treated as a slavey by her selfish stepfamily, dreams of going to the Prince's ball. She gets her wish courtesy of her Fairy Godmother, who does the pumpkin-into-coach bit, then delivers the requisite be home by midnight warning. Thoroughly enchanting the prince at the ball, our heroine hightails it at midnight, leaving a glass slipper behind. The Disney people do a terrific job building up suspense before the inevitable final romantic clinch. Not as momentous an animated achievement as, say, Snow White or Fantasia, Cinderella is a nonetheless delightful feature, enhanced immeasurably by the introduction of several funny animal characters (a Disney tradition that has held fast into the 1990s, as witness Pocahontas), and a host of a sprightly songs, including Cinderelly, A Dream is a Wish Your Heart Makes, and -- best of all -- Bibbidi Bobbidi Boo.